By now you know about my obsession errr love for soup. You also know that my dear boyfriend does not share this love with me. In fact it has gotten to the point that I don’t even mention I am making soup until the last minute. That way he can’t try to figure out something else to make for dinner! This little dilemma has led me to try to compromise a bit here and there. There either needs to be meat in the soup or I need to make something else on the side. Once I let this idea sink in (and stopped pouting because I wanted things to just go my way), I realized this wasn’t such a bad idea. I have been asked for more sandwich recipes, and soup and sandwiches is a nice casual dinner or lunch idea right? I mean I love going out and getting the soup and sandwich combos. So I started writing ideas and looking online and through my books/magazines for even more. Gumbo just popped into my head as a great place to start. I have been wanting to make it for one, and there is a ton of meat in it. I mean how could he argue with a meal that has chicken, sausage, and shrimp in it? Right, he can’t! 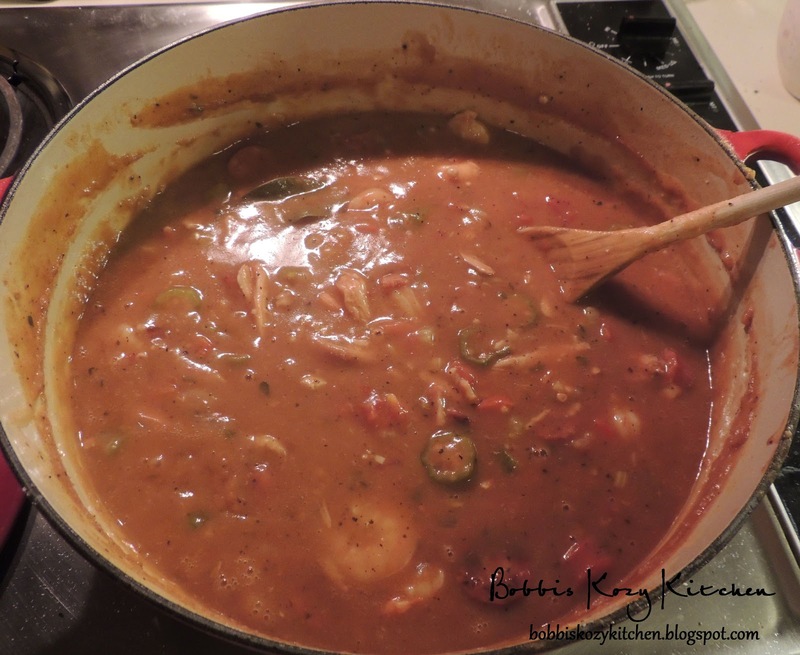 I found a recipe in Saveur (I love them) for a basic Gumbo, but I knew there were things I wanted to add. 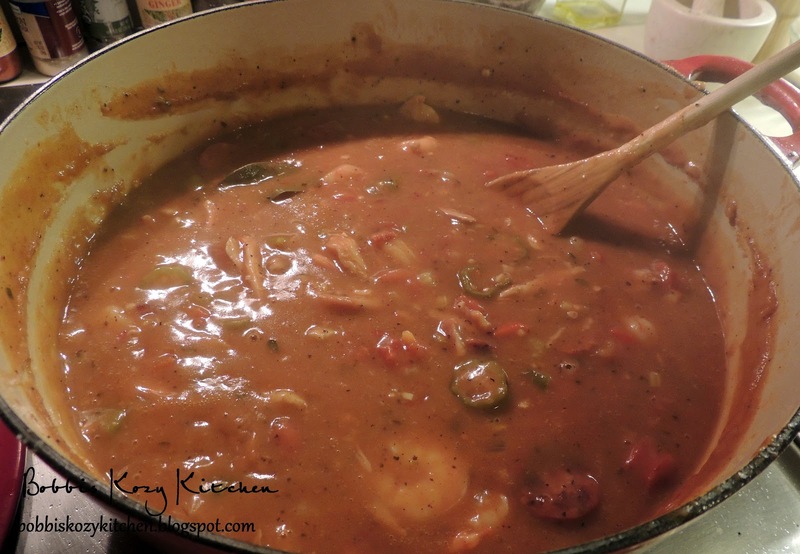 Mine might not be a “traditional” Gumbo, but it packed full of flavors with that little zing that we both love. I added shrimp and jalapeno, as well as some Franks Red Hot to boost the flavors. I already had andouille sausage and chicken thighs in the freezer so it was on!! When Kevin came home from work the first thing he said when he walked through the door was “What smells so good?” YES….chalk one up for me!! Wow do I sound like a little kid or what? Oh well, I don’t care, I like winning hehehe!